We’re pleased to announce our first Scholarship Day of Giving! 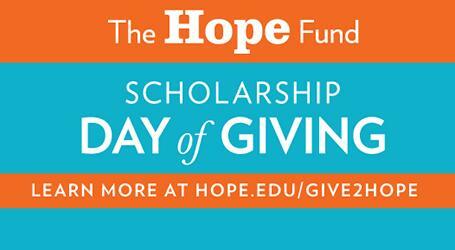 Today only, every gift to The Hope Fund will directly support student scholarships at Hope. We’re inviting every member of the Hope community to support students by participating in this 24-hour giving blitz. Our goal is 423 gifts on 4/23. We can do this with your help! Please spread the word to your friends and family. It’s all happening online at hope.edu/Give2Hope and #Give2Hope. Every gift helps us reach our goal. Call 616.395.6789 to give via phone, or stop by our tables in Phelps and Cook during lunch. The impact of your support will be multiplied with challenge funds from other donors throughout the day. Stay tuned for exciting challenges, giveaways, videos and other activity throughout the day.